The Pope, as you know created 22 new cardinals yesterday. He gave them the symbols of office: the cardinal’s biretta, a new ring and the title of a church of which they are the “pastor of” in the Diocese of Rome. Today, the feast of the Chair of Saint Peter, the faithful gather around the Pope, the Bishop of Rome, to worship God. The Church celebrates the “throne of Truth”, a fitting image of Christ passing onto us a true experience of faith, truth and love. The homily given by Benedict XVI is noted below. On this solemnity of the Chair of Saint Peter, we have the joy of gathering around the altar of the Lord together with the new Cardinals whom yesterday I incorporated into the College of Cardinals. It is to them, first of all, that I offer my cordial greetings and I thank Cardinal Fernando Filoni for the gracious words he has addressed to me in the name of all. I extend my greetings to the other Cardinals and all the Bishops present, as well as to the distinguished authorities, ambassadors, priests, religious and all the faithful who have come from different parts of the world for this happy occasion, which is marked by a particular character of universality. In the second reading that we have just heard, Saint Peter exhorts the “elders” of the Church to be zealous pastors, attentive to the flock of Christ (cf. 1 Pet 5:1-2). These words are addressed in the first instance to you, my dear venerable brothers, who have already shown great merit among the people of God through your wise and generous pastoral ministry in demanding dioceses, or through presiding over the Dicasteries of the Roman Curia, or in your service to the Church through study and teaching. The new dignity that has been conferred upon you is intended to show appreciation for the faithful labour you have carried out in the Lord’s vineyard, to honour the communities and nations from which you come and which you represent so worthily in the Church, to invest you with new and more important ecclesial responsibilities and finally to ask of you an additional readiness to be of service to Christ and to the entire Christian community. This readiness to serve the Gospel is firmly founded upon the certitude of faith. We know that God is faithful to his promises and we await in hope the fulfilment of these words of Saint Peter: “And when the chief shepherd is manifested you will obtain the unfading crown of glory” (1 Pet 5:4). Today’s Gospel passage presents Peter, under divine inspiration, expressing his own firm faith in Jesus as the Son of God and the promised Messiah. In response to this transparent profession of faith, which Peter makes in the name of the other Apostles as well, Christ reveals to him the mission he intends to entrust to him, namely that of being the “rock”, the visible foundation on which the entire spiritual edifice of the Church is built (cf. Mt 16:16-19). This new name of “rock” is not a reference to Peter’s personal character, but can be understood only on the basis of a deeper aspect, a mystery: through the office that Jesus confers upon him, Simon Peter will become something that, in terms of “flesh and blood”, he is not. The exegete Joachim Jeremias has shown that in the background, the symbolic language of “holy rock” is present. In this regard, it is helpful to consider a rabbinic text which states: “The Lord said, ‘How can I create the world, when these godless men will rise up in revolt against me?’ But when God saw that Abraham was to be born, he said, ‘Look, I have found a rock on which I can build and establish the world.’ Therefore he called Abraham a rock.” The prophet Isaiah makes reference to this when he calls upon the people to “look to the rock from which you were hewn … look to Abraham your father” (51:1-2). On account of his faith, Abraham, the father of believers, is seen as the rock that supports creation. Simon, the first to profess faith in Jesus as the Christ and the first witness of the resurrection, now, on the basis of his renewed faith, becomes the rock that is to prevail against the destructive forces of evil. 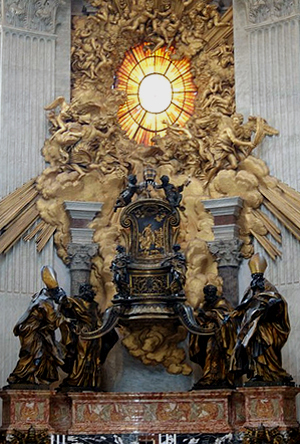 Dear brothers and sisters, this Gospel episode that has been proclaimed to us finds a further and more eloquent explanation in one of the most famous artistic treasures of this Vatican Basilica: the altar of the Chair. After passing through the magnificent central nave, and continuing past the transepts, the pilgrim arrives in the apse and sees before him an enormous bronze throne that seems to hover in mid air, but in reality is supported by the four statues of great Fathers of the Church from East and West. And above the throne, surrounded by triumphant angels suspended in the air, the glory of the Holy Spirit shines through the oval window. What does this sculptural composition say to us, this product of Bernini’s genius? It represents a vision of the essence of the Church and the place within the Church of the Petrine Magisterium. The chair of Peter evokes another memory: the famous expression from Saint Ignatius of Antioch’s letter to the Romans, where he says of the Church of Rome that she “presides in charity” (Salutation, PG 5, 801). In truth, presiding in faith is inseparably linked to presiding in love. Faith without love would no longer be an authentic Christian faith. But the words of Saint Ignatius have another much more concrete implication: the word “charity”, in fact, was also used by the early Church to indicate the Eucharist. The Eucharist is the Sacramentum caritatis Christi [the sacrament of the love of Christ] through which Christ continues to draw us all to himself, as he did when raised up on the Cross (cf. Jn 12:32). Therefore, to “preside in charity” is to draw men and women into a eucharistic embrace – the embrace of Christ – which surpasses every barrier and every division, creating communion from all manner of differences. The Petrine ministry is therefore a primacy of love in the eucharistic sense, that is to say solicitude for the universal communion of the Church in Christ. And the Eucharist is the shape and the measure of this communion, a guarantee that it will remain faithful to the criterion of the tradition of the faith. The great Chair is supported by the Fathers of the Church. The two Eastern masters, Saint John Chrysostom and Saint Athanasius, together with the Latins, Saint Ambrose and Saint Augustine, represent the whole of the tradition, and hence the richness of expression of the true faith of the one Church. This aspect of the altar teaches us that love rests upon faith. Love collapses if man no longer trusts in God and disobeys him. Everything in the Church rests upon faith: the sacraments, the liturgy, evangelization, charity. Likewise the law and the Church’s authority rest upon faith. The Church is not self-regulating, she does not determine her own structure but receives it from the word of God, to which she listens in faith as she seeks to understand it and to live it. Within the ecclesial community, the Fathers of the Church fulfil the function of guaranteeing fidelity to sacred Scripture. They ensure that the Church receives reliable and solid exegesis, capable of forming with the Chair of Peter a stable and consistent whole. The sacred Scriptures, authoritatively interpreted by the Magisterium in the light of the Fathers, shed light upon the Church’s journey through time, providing her with a stable foundation amid the vicissitudes of history. After considering the various elements of the altar of the Chair, let us take a look at it in its entirety. We see that it is characterized by a twofold movement: ascending and descending. This is the reciprocity between faith and love. The Chair is placed in a prominent position in this place, because this is where Saint Peter’s tomb is located, but this too tends towards the love of God. Indeed, faith is oriented towards love. A selfish faith would be an unreal faith. Whoever believes in Jesus Christ and enters into the dynamic of love that finds its source in the Eucharist, discovers true joy and becomes capable in turn of living according to the logic of gift. 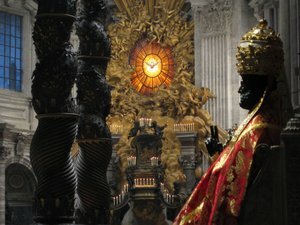 True faith is illumined by love and leads towards love, leads on high, just as the altar of the Chair points upwards towards the luminous window, the glory of the Holy Spirit, which constitutes the true focus for the pilgrim’s gaze as he crosses the threshold of the Vatican Basilica. That window is given great prominence by the triumphant angels and the great golden rays, with a sense of overflowing fulness that expresses the richness of communion with God. God is not isolation, but glorious and joyful love, spreading outwards and radiant with light. Dear brothers and sisters, the gift of this love has been entrusted to us, to every Christian. It is a gift to be passed on to others, through the witness of our lives. This is your task in particular, dear brother Cardinals: to bear witness to the joy of Christ’s love. We now entrust your ecclesial service to the Virgin Mary, who was present among the apostolic community as they gathered in prayer, waiting for the Holy Spirit (cf. Acts 1:14). May she, Mother of the Incarnate Word, protect the Church’s path, support the work of the pastors by her intercession and take under her mantle the entire College of Cardinals. Amen! In a public Consistory the Pope created 22 new Cardinals today, though 4 are over 80 years of age and therefore cannot vote in a papal conclave. The College of Cardinal is divided into three groups, cardinal bishops, priests and deacons. There is a dean and a vice dean of the College. Only by exception are cardinals not bishops or consecrated before being created cardinal per the Code of Canon Law (Cardinal Karl Becker was not consecrated a bishop prior to today’s bishop and very often Jesuits created a cardinal who are 80 and above are typically dispensed from being consecrated; Avery Dulles was). Cardinal priests who are diocesan bishops of dioceses, while curial officials are made Cardinal Deacons. The tradition of the Church is that after a number of years as a cardinal deacon one can be “promoted” to the order of cardinal priests. Some cardinals in key positions, such as the Dean of the College or prefect of an important Vatican congregation, e.g., CDF, are elevated to an open slot among the six Cardinal Bishops. There are seven cardinalatial titular dioceses, but by tradition the Dean always has two, Ostia and one other. There are also a four Cardinal Patriarchs of Eastern Churches, who rank in the College just after the Cardinal Bishops. 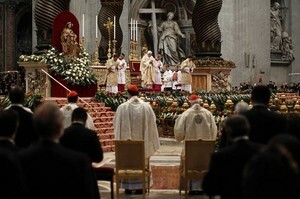 If you watched the ceremony each of the cardinals walked away from the Pope with a scroll. The scrolls documents man’s name as a cardinal and gives the name of his Roman church. Cardinal Fernando Filoni, diaconate of Nostra Signora di Coromoto in San Giovanni di Dio. Cardinal Manuel Monteiro de Castro, diaconate of San Domenico di Guzman. Cardinal Santos Abril y Castello, diaconate of San Ponziano. Cardinal Antonio Maria Veglio, diaconate of San Cesareo in Palatio. Cardinal Giuseppe Bertello, diaconate of Santi Vito, Modesto e Crescenzia. Cardinal Francesco Coccopalmerio, diaconate of San Giuseppe dei Falegnami. Cardinal Joao Braz de Aviz, diaconate of Sant’Elena fuori Porta Prenestina. Cardinal Edwin Frederick O’Brien, diaconate of San Sebastiano al Palatino. Cardinal Domenico Calcagno, diaconate of Annunciazione della Beata Vergine Maria a Via Ardeatina. Cardinal Giuseppe Versaldi, diaconate of Sacro Cuore di Gesu a Castro Pretorio. 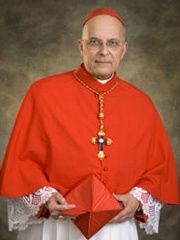 Cardinal George Alencherry, title of San Bernardo alle Terme. Cardinal Thomas Christopher Collins, title of San Patrizio. Cardinal Dominik Jaroslav Duka, O.P., title of Santi Marcellino e Pietro. Cardinal Willem Jacobus Eijk, title of San Callisto. Cardinal Giuseppe Betori, title of San Marcello. Cardinal Timothy Michael Dolan, title of Nostra Signora di Guadalupe a Monte Mario. Cardinal Rainer Maria Woelki, title of San Giovanni Maria Vianney. Cardinal John Tong Hon, title of Regina Apostolorum. Cardinal Julien Ries, diaconate of Sant’Antonio di Padova a Circonvallazione Appia. 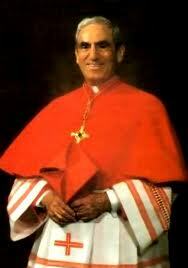 Cardinal Prosper Stanley Grech, O.S.A., diaconate of Santa Maria Goretti. Cardinal Karl Josef Becker, S.J., diaconate of San Giuliano Martire. At the moment, the ranking Cardinal Bishop is the Dean, Angelo Cardinal Sodano who has both Diocese of Albano and the Diocese of Ostia. The Salesian Tarcisio Cardinal Bertone, the Secretary of State, is a cardinal bishop of Frascati. He is the Camerlengo. The ranking Cardinal Deacon is Jean-Louis Pierre Cardinal Tauran of the diaconal church S. Apollinare alle Terme Neroniane-Alessandrine. He is still an elector. That makes him the Protodeacon. He gets to announce the name of the newly elected Pope. With these words the entrance hymn has led us into the solemn and evocative ritual of the ordinary public Consistory for the creation of new Cardinals, with the placing of the biretta, the handing over of the ring and the assigning of a titular church. They are the efficacious words with which Jesus constituted Peter as the solid foundation of the Church. On such a foundation the faith represents the qualitative factor: Simon becomes Peter – the Rock – in as much as he professed his faith in Jesus as Messiah and Son of God. In the proclamation of Christ the Church is bound to Peter and Peter is placed in the Church as a rock; although it is Christ himself who builds up the Church, Peter must always be a constitutive element of that upbuilding. He will always be such through faithfulness to his confession made at Caesarea Philippi, in virtue of the affirmation, “You are the Christ, the Son of the living God”. The words Jesus addressed to Peter highlight well the ecclesial character of today’s event. The new Cardinals, in receiving the title of a church in this city or of a suburban Diocese, are fully inserted in the Church of Rome led by the Successor of Peter, in order to cooperate closely with him in governing the universal Church. These beloved Brothers, who in a few minutes’ time will enter and become part of the College of Cardinals, will be united with new and stronger bonds not only to the Roman Pontiff but also to the entire community of the faithful spread throughout the world. In carrying out their particular service in support of the Petrine ministry, the new Cardinals will be called to consider and evaluate the events, the problems and the pastoral criteria which concern the mission of the entire Church. In this delicate task, the life and the death of the Prince of the Apostles, who for love of Christ gave himself even unto the ultimate sacrifice, will be an example and a helpful witness of faith for the new Cardinals. Last evening at 9:15pm, Anthony Joseph Cardinal Bevilacqua, 88, 7th archbishop of Philadelphia, died in his sleep in his quarters at Saint Charles Borromeo Seminary. He retired from his episcopal duties in 2003. Philly.com has an extended article on the late Cardinal (1923-2012). He was appointed to the Archdiocese of Philadelphia in 1987 and installed in 1988. HAVING LEARNED WITH SADNESS OF THE DEATH OF CARDINAL ANTHONY BEVILACQUA, ARCHBISHOP EMERITUS OF PHILADELPHIA, I OFFER MY HEARTFELT CONDOLENCES TO YOU AND TO ALL THE FAITHFUL OF THE ARCHDIOCESE. I JOIN YOU IN COMMENDING THE LATE CARDINAL’S SOUL TO GOD, THE FATHER OF MERCIES, WITH GRATITUDE FOR HIS YEARS OF EPISCOPAL MINISTRY AMONG CHRIST’S FLOCK IN PHILADELPHIA, HIS LONGSTANDING COMMITMENT TO SOCIAL JUSTICE AND THE PASTORAL CARE OF IMMIGRANTS, AND HIS EXPERT CONTRIBUTION TO THE REVISION OF THE CHURCH’S LAW IN THE YEARS FOLLOWING THE SECOND VATICAN COUNCIL. TO YOU, AND TO ALL THE CLERGY, RELIGIOUS AND LAITY OF THE CHURCH IN PHILADELPHIA, AND TO THE MEMBERS OF HIS FAMILY, I CORDIALLY IMPART MY APOSTOLIC BLESSING AS A PLEDGE OF CONSOLATION AND PEACE IN OUR LORD JESUS CHRIST. May God be merciful to His Eminence. 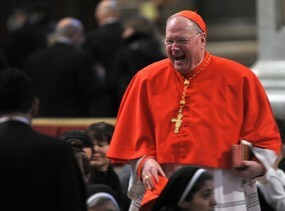 Today is Cardinal Francis Eugene George’s 75th birthday. Congrats and continued blessings!!! His Eminence is this nation’s highest profiled cardinal and bishop who is a superb public thinker as well as a pastor of souls. Since 1997 he’s been the archbishop of Chicago and since 1998 he’s been a member of the College of Cardinals. Both positions were given to him by Blessed Pope John Paul II. A diocesan bishop who has completed the seventy-fifth year of age is requested to present from office to the Supreme Pontiff, who will make provision after he has examined all the circumstances (401). The Chicago Tribune ran this article today. 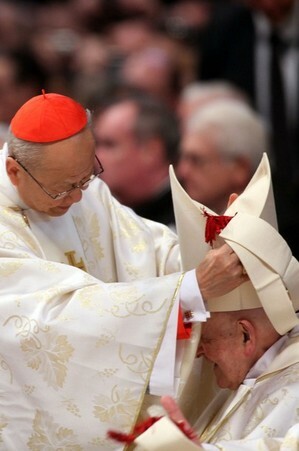 Pray for Cardinal George and for the Archdiocese of Chicago.